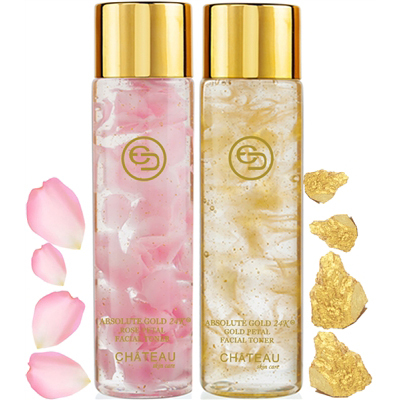 Absolute Gold 24K Rose Petal Hydration Facial Toner. For all skin types. An ultra-fine hydrating toner, suitable for all skin types, infused with 24 Karat Gold and a unique collagen complex. Rich in seaweed extract, it replenishes skin while leaving a hydrated and healthy finish. Apply with fingertips all over the face and neck. You may also apply with a cotton pad or ball after cleansing and before serum and moisturizer are applied. Distilled Water, Glycerine, Butylene Glycol, Lubarjel, Collagen, Seaweed extract, Ginseng Extract, Calcium Alginate, Propylene Glycol, 1,2-Hexanediol, Red5(CI12490), Titanium Dioxide(CI77891), Carbomer, Triathenolamine, Phenoxyethanol, Methyl P-hydroxybenzonate, 24k gold. step 1: Uncover the plastic bottle cap. step 2: Uncover the second, smaller plastic cap that will appear after the first plastic cap was removed. Made in USA.